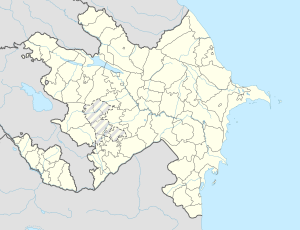 Shirvan (Azerbaijani: Şirvan, prior tae 1938 Zubovka, frae 1938 tae 2008, Ali Bayramli, Azerbaijani: Əli Bayramlı, an aw umwhile, Arab Shakhverdi, is a ceety in Azerbaijan, locatit on the Kura River. Its umwhile name, Ali Bayramli, wis tae honor Ali Bayramov the ceety wis renamit tae Shirvan bi the decision o the Parliament o Azerbaijan on 25 Aprile 2008. The ceety forms ane o the admeenistrative diveesions o Azerbaijan. The simmer months are typically dry an vera hot due tae Shirvan's semi-desert climate, temperatur column coud be risen tae 44 °C aften resultin in moderate drocht conditions. In contrast, winter is mild, rarely temperatur is descendit up tae -6 °C. Anatoly Kuleshov — Meenister o Internal Affairs o the Republic o Belaroushie (2009). Enver Bariev — Meenister for Emergency Situations o the Republic o Belaroushie (syne 2005). Rafael Habibov — Naitional Hero o Azerbaijan. Shirin Shukurov — Hero o the Soviet Union. ↑ "Шукюров Ширин Агабала оглы" (in Roushie). Heroes of the country. Wikimedia Commons haes media relatit tae Shirvan (city).